Africa has made notable progress in its nascent democracy but with uneven performance across countries. However, across the board, challenges abound. Central to Africa’s checkered democratic narrative is the weakness of its democratic institutions, participatory mechanisms and accountability platforms. This book interrogates these elements with the role and capacity of the parliament, political parties, media, freedom of information law, trade union movements, gender empowerment mechanisms and accountability methods and processes all under examination. The weakness of democratic institutions has had a corrosive effect on political accountability and limits the scope for popular participation in governance. In many countries, innovative practices, and new social and political encounters are emerging that challenge old institutional cultures, promote reforms and demand accountability from the governing elite. The book captures these varied, innovative patterns of democratic change. With first hand knowledge and expertise of the continent, the contributors analyze the issues, trends, problems and challenges in these critical areas of Africa’s democratic growth. 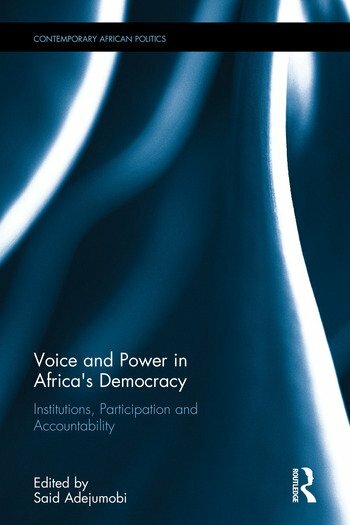 The conclusion is that strengthening democratic institutions, opening up the political space for enhanced political participation and ensuring political accountability will determine the course, prospects and quality of Africa’s budding democracy. 4. The Presidency and Democratic Developmentalism in Southern Africa, George Kieh, Jr.
Said Adejumobi is Director of United Nations Economic Commission for Africa (UNECA) Sub-Regional Office for Southern Africa based in Lusaka, Zambia. Before then, he was the Director of the Governance and Public Administration Division of the UNECA at the headquarters in Addis Ababa, Ethiopia. He holds a PhD in Political Science and was a University Professor who taught for about two decades. He also served as Governance Adviser to the ECOWAS Commission in Abuja, Nigeria. He has published extensively in the areas of Democracy, Governance, and Socio-economic Development in Africa with 8 books and over 70 scholarly articles in learned journals and chapters in books.